Up until now, I thought that only prostitutes and the airlines made one pay to get screwed. Now, we can add the New York Metropolitan Baseball Team. The Mets are an abysmal, rudderless team that, despite a recent renaissance, will go nowhere this year. They’re a bad product that consistently whets fans’ appetites with occasional above average and sometimes even stellar play, only to fall apart when the chips are down. Take last season, please. And take Tuesday night’s debacle against the Phils, please. So, what does a consistently disappointing team do? Double the cost of ticket prices naturally. 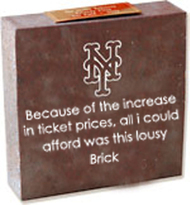 Raising Mets season-ticket holder prices is wrong for every conceivable reason. In addition to further alienating a fan base that is ready to choke the next player who chokes in a critical spot, the Mets have made attending one of their games prohibitively expensive (it’s always been emotionally expensive. Now, it’s just a plain rip-off). One can count on death, taxes and the Mets blowing a lead. Here’s hoping the Mets organization can count on a lot fewer paying fans next season. If ever a team decision deserved a fan boycott, it’s this one. This entry was posted in Baseball, Current Affairs, Professional Sports, Reputation Management by RepMan. Bookmark the permalink. Stand in line, Chipper. The Braves had their day in the sun. That said, the chop has to go. Worst interactive fan exercise since the wave’s invention. I going to argue that my Atlanta Braves are the most frustrating team in baseball. For starters, our 35-year-old pitcher with a career ERA around 4.00 that made $15.5 million last year hasn’t thrown a major league pitch since August 2005. Our win last night was marred by our best pitcher (Hudson) and best hitter (Chipper) both leaving the game early with injuries. And the fans are terrible. After 14 straight division titles, our annual post-season appearance became expected, and now that we can barely turn in a .500 record, fans have grown complacent and apathetic. What happened to our crazy fans who drove us to back-to-back worst-to-first seasons in ’91 and ’92? We must have lost them to free agency. Thanks for the note, OnTheFencePRGuy. The Mets did indeed turn things around in their three-game set with the Phils. That said, they remain the most frustrating team in the baseball world (with the possible exception of, say, the Cubs). The Mets are always loaded with talent, play exceedingly well for a stretch and then end up choking. The Wilpons should be paying Mets fans for their loyalty, not doubling season ticket prices. I beg to differ on your post, which I read before I went out to Shea and watch the Mets pull into first place. I think your leftover animus from last September (which I sympathize with) is outweighing reason here. Yes, corporate VIP seating and free agency, plus ridiculously tax incentivized stadiums like Citigroup puts attendance out of reach for many Mets fans, including me. The Wilpons are no worse than any other owners caught in this 30-plus-year cycle, make changes when needs, and now own a team with a real chance. Why are you raining on our parade? The only NYC sports team to boycott in NYC for mismanagement is Jim “Idiot Son” Dolan’s Knicks. I can’t argue with your Meadowlands comment. That is a disgrace. But, the Mets are unique in their ability to tease their fans with what might be. The Yankees and Giants deliver. The Jets never will, but no one expects them to. I think the big reason for the increase in prices has to do with the fact that they have decreased the number of seats. Couple that with a stadium that is supposed to be really nice and you have created a higher demand for tickets. Additionally, they have a good product on paper – cant speak to the choking – so they should be able to keep interest in attendance up for at least the next five years. That being said, I think what the mets and Yankees are doing are far better then PSLs that the Giants and Jets have created. If you want a rip off, go to the meadowlands.